Leupold VX-3 3.5-10x50mm Duplex Rifle Scope Review - How Good Is It? Anybody familiar with Leupold as an optics manufacturer will not need a review to convince him or her to buy a Leupold VX-3. A relatively low budget offering from a high end manufacturer, you will find nothing cheap about this scopes performance. With ultra bright, high contrast images that help you pull game from its surroundings, the Leupold VX-3 is an easy to use yet rugged scope with features such as the 50mm objective lens and Leupold’s proprietary lens coatings allowing you make every shot count. Conceived from a manufacturer with over 100 years of experience in creating quality optics for all manner of practical applications, the Leupold VX-3 has to meet some very high expectations. Obviously, the first important consideration is the magnification standards. The Leupold VX-3 features variable magnification ranging from 3.5-10X, giving you the flexibility of being able to choose the best magnification setting that will guarantee you a kill. You can adjust the zoom based on the target’s distance as well as account for other factors such as field of view and whether the target is moving or static, giving you a definite advantage in the field. On a related note, the Leupold VX-3 also offers a very handy 11 feet of field of view. As mentioned in the previous paragraph, the field of view is directly related to the magnification settings. The field of view is the measure of the distance you can see from left to right through your scope. A larger field of view is usually preferred to allow more terrain to be seen through the scope, hence making it easier to locate game while also making it much easier to track moving targets. So here, the variable magnification allows you to easily adjust the field of view to your liking, ensuring that every shot is right on target. One of the most important considerations when buying a scope is whether the image quality is any good. With the VX-3, you can rest assured because, being a Leupold product, good optics are taken as a basic requirement. Not only is the image bright and sharp, but it offers great resolution and contrast at all magnifications, easily allowing you to distinguish game from their surroundings. So all in all, the Leupold VX-3 has gotten off to a strong start in terms of the basic requirements any scope should meet. The objective lens is probably the most important part of the optics of any scope, as shown by the fact that all scope descriptions include the objective lens diameter immediately after the magnification. The reason for this prime location is that the objective lens is the foremost lens in the scope, the one closest to the target. Hence, any light reflecting off the target has to go through the objective lens first before any of the other lenses, making its characteristics very important in determining the performance of the scope. Usually, the size is a good estimate of the abilities of the objective lens, because the larger the scope, the better are its light gathering qualities simply from the fact that more light can enter through it. The result is a bright image with sharp colors and great low light performance. The Leupold VX-3 sports a hefty 50mm. objective lens, which is quite large considering that most scopes make do with an average objective lens of 40mm. Add the famous Leupold optics quality, and you have the full assurance that this scope is not just a gimmick but a serious piece of precision equipment. Having discussed the main offering from the Leupold VX-3, let us consider a few of the minor details such as the eye relief. The eye relief is the distance that the eye is to be kept from the scopes nearest lens to get a clear image. Scopes are designed in this way to protect users from an injury called scope eye which involves a nasty cut or bruise above the eye due to the scope hitting the eye during sharp recoils. The Leupold VX-3 has 3.6 inches of eye relief which is quite generous considering that most scopes only offer 2.7 to 3 inches of eye relief. So you can rest assured that you will be safe even when using the scope with high recoil cartridges or rifles. The is a very important number for some, but most will be much more interested in what the Leupold VX-3 has to offer on the precision front. For starters, we get the windage and elevation knobs to help account for variable altitudes and wind conditions which have been cryogenically treated to ensure precise clicks that can make the difference between a hit and a miss. In addition to these, the Leupold VX-3 is armed with a fast focus eye piece that will ensure that you can easily adjust to variable ranges without any delay or disorientation. The result is an easy to use, flexible and extremely accurate scope. The VX-3 has been given the VIP treatment on the optical coatings front, getting Leupold’s Xtended Twilight Lens System that is specifically designed to transmit low light wavelengths allowing you to see low light scenarios in exceptional brightness. 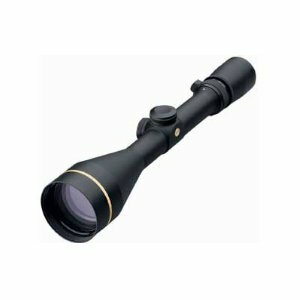 This and other coatings covering the lenses ensure the transmission of light without hindrance, giving the Leupold VX-3 one of the best optics in the scope market. However, a scope is useless if it fails to perform in the rigors of hunting. The people at Leupold have used their trademark DiamondCoat lens coatings on the exterior lens to ensure that they remain scratch resistant. In addition to this, the scope itself is completely shock proof and fog proof. It has also be treated with Leupold’s patented Argon/Krypton mixture that guarantees water resistance in all types of hunting conditions. Although the Leupold VX-3 comes scope cover provided from the manufacturer, it would be a good idea to purchase a flip open cover that offers the rare blend of protection as well as convenience actual hunting situations. In addition to this, a laser boresighter would also be a good addition to your arsenal, allowing you to sight in your scope with accuracy and without wasting any ammunition. You might want to consider to get some basic accessories for your scope that can really help in the field. The first is the Bushnell Laser Boresighter which can help to ease the process of sighting in your Leupold VX-3 3.5-10x50mm Duplex rifle scope precisely. Another popular accessory bought regularly with the Leupold VX-3 Rifle Scope are the Leupold Alumina Flip Back Lens Cover Kit-40Mm And Standard Ep 62990 to protect your scope. Read more customer reviews about the Leupold VX-3 3.5-10x50mm Duplex Rifle Scope . With the Leupold VX-3, you can rest assured that you get your money’s worth. Although a low budget offering from a company that manufactures some scopes in a price range some would regard as obscene, the Leupold VX-3 will satisfy all your scope requirements without breaking a sweat. Nothing comes close to it in terms of clarity and image quality, providing you with high contrast images in all manner of light conditions which is down to its amazing objective lens and high quality lens coatings. The rugged build quality also helps ensure that you can use it without hesitation in the harshest of conditions. Lastly, you will love the life time warranty that Leupold offers, showing their faith in their amazing product. Click here to find current pricing and more information on the Leupold VX-3 3.5-10x50mm Duplex Rifle Scope . Check out our other rifle scope reviews if you want more in-depth analysis of different hunting scopes.